Warchief of the Horde | The Fat Furry Tank. A World of Warcraft Blog. As I type, the war in Pandaria rages on. Horde and Alliance fighting along the beach front of Krasarang wilds, each one trying to gain as many resources as possible to aid in their war effort. This is nothing new, we have seen this before, even without the quest lines to play it out for us. I remember my first foray into Ashenvale and coming across the Warsong Lumber Camp. There were no quests here for me, but it still intrigued me. It was gritty, and filled with orc peons (haha peons…) wandering around gathering lumber. But what for? I guess the thing that jumps to my mind is that the leader of the Horde is not a king, a prime minister, or… I dunno… a Tsar! They’re a warchief. So as far as the Horde is concerned, they’re always preparing for war, whether there be one or not. It is the essence of the Horde. To fight. The original Horde arrived in Azeroth, tainted with demon’s blood and hungry for battle. So it goes without saying that the two factions will never truly live in peace, the sins of the fathers and such. However the tenuous relationship between the Tauren’s and the Horde is becoming more and more strained. The tauren’s are indebted to the Horde for helping them drive back the centaur and reclaim the plains of Mulgore, however when Garrosh killed Cairne, the anger and betrayal that ripped through the Tauren’s was horrific. Garrosh caused the rift to begin with, by heeding Magatha Grimtotem’s offer of ‘help’, thereby allowing her to strike the fatal blow, through Garrosh’s hands. With Cairne dead, Magatha then attacked Tauren towns and destroyed them, hoping to kill Baine at the same time. 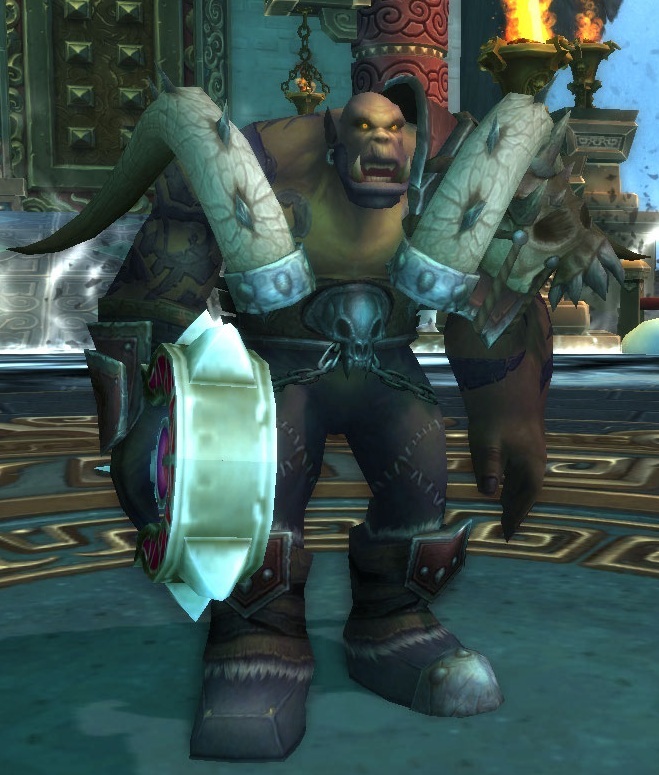 Some may say that Garrosh atoned for that by refusing to aid Magatha in her defense of Thunder Bluff when Baine launched his assault on it to take it back, however he also did not offer any aid to Baine, even though it was Garrosh’s hand and actions that brought this upon the Tauren. I’m getting a touch off track here. It just seems that this expansion is not just about the war between the two factions, but also the tenuous relationships that hold them together. Everyone knows Garrosh has to go… it’s pretty much inevitable. He’s a warmongering, blood thirsty leader and as such is leading his Horde the same way that they were lead by Blackhand (although under the influence and power of Gul’dan) he wants war. He wants to own everything. He is ruthless in his onslaught, seeking out anything and everything that can aid him in his conquest of the alliance, Azeroth, and now Pandaria. Even they’re having their fair share of in house arguments at this time. I have just finished my shieldwall quests and the story the evolved from those was a very engaging one. I enjoyed it thoroughly. Seeing the change in Varian, brought about in part by Anduin, has been interesting. This then follows to the change in Jaina Proudmoore. Normally so collected, and calm… the betrayal from within her own Kirin’Tor by the Sunreavers has all but left her, what appears to be, a little mad. I can’t say as much on this point as I am yet to read “Tides of War” but it’s almost like she’s finally let the anger, and rage that has been following her around since her childhood, and then early adulthood regarding Arthas/The Lich King, then the destruction of her home Theramore has gotten the better of her. There is a questline within Shieldwall that takes you to Darnassus. It is here that you learn the Divine Bell that the Alliance (you) had found and then had spirited away, was in fact being housed and protected in the Elven City. However it has been taken. You follow Jaina on a tracking mission only to come across a portal to Dalaran. In that instance Jaina seems to snap. She realizes that people from within the Kirin’Tor (the Sunreavers) were behind the theft, and thus have been enfolded into the Horde. She goes on the warpath back in Dalaran, and sends you to kill high ranking Sunreaver’s throughout the Magic City. I believe Varian is trying to be better, because it’s what Anduin is hoping for. Anduin doesn’t want any harm brought to Pandaria (too late little man!!) and as such, Varian is trying his hardest to protect those he loves and cares about, including his people, without resorting to the type of viciousness and brutality that Garrosh enjoys. However it’s causing a rift between him and the other governing bodies of the Alliance. 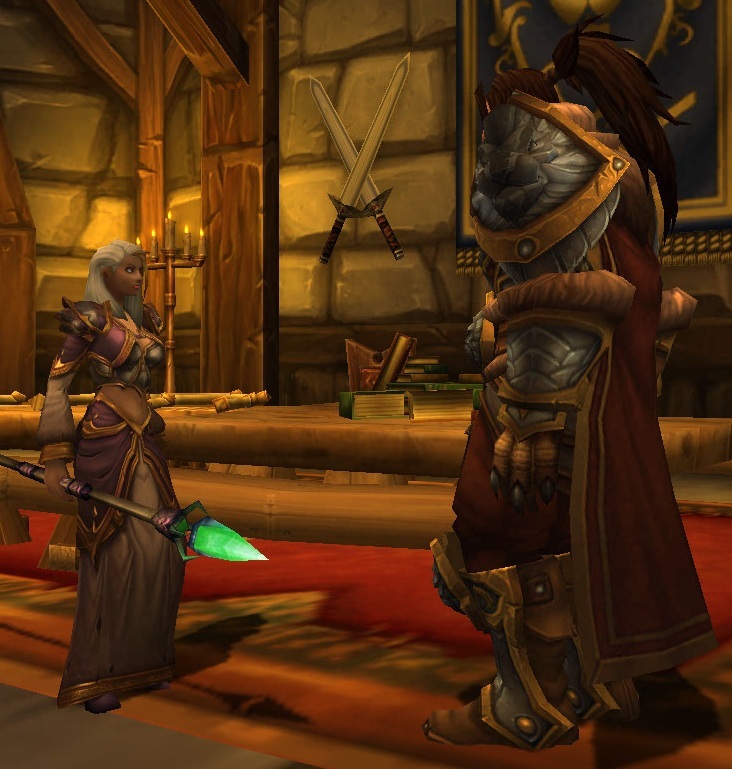 There’s another quest line that involves a Sha Touched Claw (not the one from the Sha of Anger) When it is brought before the leaders of the Alliance, most of them want to study it, to try and harness it’s power to use against the Horde. Varian asks Anduin (Wait what?!) if he thinks this is a wise move. Anduin disagrees, stating that the dark sha power is too unpredictable and should be destroyed… So Varian destroys it. In an effort to please his son, and an attempt to be less brutal, he is in turn creating tension between himself and the others. So peace on Azeroth… I don’t see it coming any time soon. I believe that if there is a tenuous peace between the Horde and Alliance, it would only be because they are too busy fighting among themselves. For this is what is happening, from my perspective, right now. So I’m a little late! Random ramblings from this week!! A blog about shamans and other things in the World of Warcraft. Nobundo forever. Hugs and kisses from the Horde! Disc priest and relic hunter with a love of transmog, pets, achievements, silver dragons and other fun things. Also known as Cymre Brightblade.